If El Salvador’s Supreme Court does not act quickly, one of its citizens could die of a treatable condition. The citizen, a 22-year-old woman (and mother of a one-year old son) known only as Beatriz, is critically ill and needs an abortion in order to survive. Beatriz has lupus, and the resultant kidney failure and hypertension makes carrying a sick fetus an impossible task. The fetus she is carrying is anencephalic, meaning that it is developing without a brain and without certain parts of the skull. The fetus has been pronounced non-viable by doctors, and the Salvadoran president, Mauricio Funes, along with El Salvador’s Minister of Health, María Isabel Rodríguez, have declared his support for Beatriz to have the abortion necessary to save her life. However, abortion is illegal in El Salvador under all circumstances, and so the fight to save Beatriz’s life was taken to the Supreme Court. After stalling for weeks, the court announced Wednesday that it intends to release its decision within the next two weeks. El Salvador’s abortion laws are so severe in large part because of the prevalence of Catholicism there — roughly three-quarters of the state’s population is Roman Catholic. Although there are many Catholic individuals who are in favor of choice in terms of abortion, or at least in favor of abortion in cases where it is necessary to save the life of the mother, Catholic authorities in El Salvador are wholly unsympathetic to Beatriz’s plight. Salvadoran archbishop José Luis Escobar declared in April that it would be “unbelievable, inhuman, and against nature” for Beatriz to receive the life-saving abortion. Legal prohibition of abortion — even to save the mother’s life — is not unique to El Salvador. An Irish citizen, Savita Halappanavar, died last October when her doctors refused to abort her dying fetus. Halappanavar slowly miscarried the child and succumbed herself to the resultant blood poisoning. Ireland Prime Minister Enda Kenney now supports passage of a bill that would enable abortion to save the life of the woman carrying the fetus, a political move that has drawn fire from archbishops around the world. That a predominantly Catholic country would enforce laws that aligned with the Vatican’s views on abortion is unsurprising. However, that El Salvador would be so willing to essentially condemn a citizen to death when the procedure that would save her life is so accessible seems out of keeping with the principles of mercy usually espoused by religious authorities. 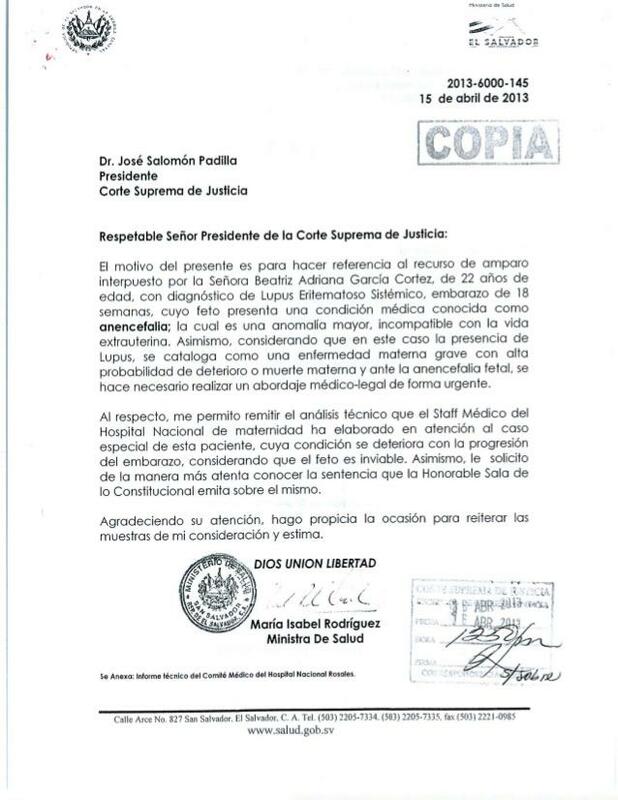 Beatriz’s fate will be determined by El Salvador’s Supreme Court within the next fourteen days.